04/07 - (Texas) Three men accused of participating in one of the largest stock frauds in Texas history went on trial in a federal court here Monday, but scam kingpin Harris Dempsey "Butch" Ballow - who already owes $30 million in stolen money and fines - won't be around for the proceedings. The whereabouts of the longtime Texas con man, arrested in 2002 by the FBI at his $700,000 home in Tiki Island near Galveston, are unknown. But those who have followed Ballow's career believe he's living luxuriously somewhere in Central America after jumping bail here, leaving his alleged cohorts to take a collective fall for the civil securities crimes he devised and directed. "Ballow should not only be in that courtroom this week, but also arriving there in handcuffs with a federal marshal every day," said Houston oilman Jakie Sandefer, a fraud victim who helped get Ballow arrested. "It's just outrageous he's not here." Alleged to have helped Ballow steal more than $14 million in a stock scam and the defendants in a civil securities fraud trial today are defendants Marvin Mikel "Mike" Barnwell, David A. Keener and Earl Shawn Casias. The trial is in U.S. District Judge Keith Ellison's court. Ellison already has entered final judgment against Ballow in the U.S. Securities and Exchange Commission case. Ellison ruled that Ballow must repay $14,304,973 he made in the stock scam and pay an equal civil fine for running the scam. The court has approved settlements the SEC reached with nine other defendants and Ballow associates found to have participated in the fraud that involved a complicated scheme to manipulate the prices of stocks of companies that were known as EpicEdge Inc. and EVTC Inc. Some of the other defendants may testify in the case. Barnwell, 66, of San Leon in Galveston County, is a longtime Ballow associate. Keener, 42, of Keller, was EVTC's president, and Casias, 37, is a former San Diego brokerage firm employee. The firm folded after Ballow defaulted on $5.1 million in margin accounts in 2000. Ballow walked free in November 2004 after posting 10 percent of a $100,000 bond set by Houston U.S. District Judges David Hittner and Nancy K. Johnson. Ballow had pleaded guilty in September 2003 to one wire-fraud count in a stock scam that cost major brokerages at least $10 million and resulted in uncalculated losses to thousands of ordinary investors across the nation. Eleven other criminal counts were dropped in a plea agreement. Five months before his release on bond, Houston U.S. District Judge Nancy F. Atlas had ordered Ballow to pay a civil fine of $880,000 in connection with a huge stock scam unrelated to the one at issue in federal court here this week, according to SEC records. That fine had not been paid. Over the next year, prosecutors and defense attorneys repeatedly sought delays in Ballow's sentencing. Details of Ballow's plea agreement remain sealed by the court. On Dec. 16, 2004, Ballow failed to appear for sentencing. He faced up to 10 years in prison and a $500,000 fine. Ballow's career in fraud came to light after a July 29, 2001, Houston Chronicle report centered on a 1999 Harris County jury award of $8.5 million in damages to Sandefer and his former oil firm partner, Steve Smith, against Ballow. The two spent $2.5 million trying to collect that judgment. Private investigators and lawyers they hired uncovered an international web of sham corporations and brokerage accounts through which they maintained Ballow conducted frauds. Court documents alleged that Ballow had more than $100 million in various accounts and corporations just between 1999 and 2001. Although he lived in an expensive home, owned a yacht and used a private jet, Ballow once testified in a federal bankruptcy court that he had no net worth and hadn't had a checking account in years. The Internal Revenue Service told that court it had no records of him. Ballow is a four-time convicted felon, according to SEC documents. His only prison term came after an Alabama federal grand jury indicted him in 1988 for a telephone sales scam in which he and others told people they had won vacations in Mexico and could make reservations by sending $100. No one got vacations. In a plea deal, Ballow admitted to three offenses and was sentenced to five years on each. He served 19 months in federal prison before being paroled. Hittner last week declined to comment on Ballow's release. Although his was the final order allowing Ballow's release, Hittner severely chastised federal prosecutors and defense attorneys after Ballow failed to come to court for sentencing. Alma Carney put her savings in a Miami investment firm after an aunt convinced her that it was safe, and that she would get a 30 percent return each year. The nurse's aide from Fort Lauderdale was counting on profits from her $10,000 investment for a down payment on a home on Florida's Gulf coast, where she hoped to bring her children and grandchildren from Jamaica to live. Instead, she, her aunt and more than 2,000 other investors in Florida and the Caribbean were bilked out of at least $31 million in an alleged giant fraud scheme, said federal regulators who shut down the company in December. "We were just suckers," said Carney, 59. "It was all the money I had." Investors such as Carney partly blame their losses on the U.S. Securities and Exchange Commission, the federal agency charged with cracking down on securities fraud. They fear that they'll never get their money back, and they might be right. A South Florida Sun-Sentinel investigation revealed that federal watchdogs have been largely ineffective in combating securities fraud and helping victims recover their money. The review comes about 18 months after the SEC and other federal agencies set up a special task force to go after scammers. An examination of all 121 cases filed in the Southeastern United States by the SEC's Miami regional office during the past five years also uncovered a revolving door in which offenders who get caught often suffer little punishment, then move on to set up a new scam. Twenty-five percent of violators had been the subject of at least one previous regulatory or criminal action involving fraud or economic crime. Eleven percent had two or more such actions against them. Only about 20 percent of the SEC's cases against violators, including those accused of investment fraud, insider trading or filing false financial reports, resulted in criminal prosecutions, even though some involved hundreds of thousands or millions of dollars in investor losses. Only 16 of the 262 violators have gone to prison. More than two dozen others are awaiting trial or sentencing. While SEC violations have resulted in the levying of $176 million in fines and penalties, only about $6.5 million has been collected. Sometimes, fines were waived; sometimes the government got stiffed. "This is disturbing. It seems like white-collar crime pays," said Bill Newton, executive director of the Florida Consumer Action Network, an advocacy group that lobbies the Legislature. "The message is if you're a crook and you want to commit a huge crime, go for it. No one's watching." The public knows the SEC best for monitoring publicly traded companies and their accounting practices. But the agency is also supposed to protect the interests of investors who buy and sell stocks, bonds and other securities. While the SEC has been preoccupied with high-level corporate fraud, smaller-scale schemes also have been devastating to investors. About 80 percent of the 121 cases examined dealt with investment fraud, as opposed to violations such as accounting irregularities or insider trading. Investors' losses totaled at least $928 million. Some cases were minor, involving administrative infractions that officials weren't likely to refer for criminal investigation. But many cases, particularly in South Florida, revolved around boiler rooms, rented offices where aggressive salespeople on banks of phones "cold-call" potential investors; and around "Ponzi schemes," in which money from new investors is used to pay off old ones until the company collapses. That was the case of A.B. Financing and Investments Inc., which allegedly bilked Carney and other low- and middle-income people who had little or no investment experience. Carney said she believed in the company's claims, based on sales literature that falsely stated it had $36 million in assets backed by insurance. She even advised one of her sons and a cousin to open an account. Regulators said A.B. Financing was selling unregistered securities, then placing funds in speculative real estate and other investments that lost millions. The company fueled the scheme's growth by enticing old investors to solicit new ones with promises of fees and prizes, such as Caribbean cruises. The company's CEO, Anthony Blissett, agreed in March to a permanent injunction that bars him and his company from committing fraud. He did not admit or deny the allegations, which is common in SEC settlements. In an e-mail statement, his attorney, David R. Chase, of Miami, said his client is "fully cooperating" to "maximize the return of assets" to investors. David Nelson, the SEC's regional director in Miami, said it's tough to prevent fraud, especially with limited resources and an enforcement staff of about 38 attorneys, accountants and others. He said his office has been doing "a good job" and has been responding more quickly once it finds out about a suspicious investment offering. "We're trying to get in before the scheme is over. The difficulty is finding out about it," Nelson said. "Victims don't always know they've been victimized right away." Regulators say scam artists have gravitated to South Florida for decades. They particularly prey on victims who are elderly or are members of identifiable ethnic, racial, religious or professional groups, promising spectacular profits or "guaranteed" returns. In some fraud cases the newspaper examined, the SEC suspended or barred offenders from the industry. In most cases, it also asked a federal judge to freeze assets and to assess penalties and fines. By then, however, many had already spent investors' money on exotic cars, boats, jewelry, luxury homes and other personal expenses, court records show. "By the time the SEC steps in, the promoter has bought the cars and the boats, moved the money offshore, lost it in Vegas, used it as their personal piggy bank," said Marc Dobin, a Jupiter attorney who has represented securities fraud victims in civil lawsuits. The SEC said that happened in the case of Paul R. Johnson, a Canadian who lived in Deerfield Beach and was president of Link Express Delivery Solutions, a package delivery company. Johnson and three others allegedly defrauded more than $15.5 million from about 400 investors in a false stock offering that they said would finance the company, according to an SEC civil lawsuit filed in December 2001. A month later, Johnson was criminally indicted on charges that included securities fraud, conspiracy to commit securities fraud and money laundering. Federal prosecutors alleged that he diverted about $2.5 million in investors' money, spending about $740,000 on a South Beach nightclub; $615,000 for gambling debts; $219,422 for bodyguards, personal valets and other "entourage members"; $26,128 at strip clubs; and $2,500 for a friend's breast enhancement surgery. Johnson, 32, denied the SEC's allegations and pleaded not guilty to the criminal charges. He said Link Express was legitimate, and the bulk of investors' money was spent on the business. The company prospectus disclosed that some money was intended for his personal use, Johnson said, so there was no misrepresentation. "I have never denied that certain money was spent [for personal use], but what the government has failed to show me is why they believe the money didn't belong to me," Johnson said in a June interview at the Palm Beach County Jail, where he was being held. "I intend to fight all of these allegations because they're untrue." The SEC's lawsuit against Johnson is on hold until the criminal matter is resolved. Glenn Gordon, the SEC's deputy regional director, said "fraudsters" want to look like they are living "high off the hog." But he said, "They may not be good at managing their own finances. It costs money to run these scams. You have to live flashy." SEC regulators point to The Gaming Factory, a West Palm Beach boiler room that allegedly used high-pressure telephone sales to solicit investors for an Internet Web site that offered casino gaming and sports wagering. In a May 2002 lawsuit, the SEC said the company's sales representatives falsely told investors that dividends would generate a return "well over 100 percent annually" and that the company had a gaming license in Panama. Last July, a federal judge permanently prohibited company President Richard Onorato, of Lake Worth, from violating securities laws and decided to fine him an amount not yet determined. Onorato agreed to the judgment without admitting or denying the allegations. Michael Tein, a Miami attorney whom the court appointed to gather the company's assets, discovered that much of investors' money had disappeared into pleasure trips, country club and yacht club memberships, restaurants, jewelry and car stereo equipment, court records show. Tein said he had no luck finding the company's remaining assets, which he thought were in Costa Rica. He recovered $76,257 out of about $1.9 million invested. Onorato's attorney, Kenneth Dunn of Coral Springs, rebutted the fraud charges and said his client dedicated much of his time and personal money to the company. "This was a business he wanted to see work." No money is hidden in Costa Rica, he said, adding that the SEC prematurely shut down Onorato's business. Onorato, 28, has gotten into trouble with regulators before. In 1999, the Pennsylvania Securities Commission ordered him and a company he controlled to stop committing fraud by selling unregistered securities, court records show. Dunn said his client thought it would be easier to comply than to register or fight the allegations. Onorato's past run-in with officials isn't unusual among the violators the SEC sues. The newspaper's review found that at least 66 violators either had prior criminal fraud or theft convictions or had been cited previously by state securities officials or agencies such as the Commodity Futures Trading Commission, which regulates commodities trading in the United States. Twenty-eight of them were the subject of at least two such actions, and 13 had three or more. "It's typical for these people to work on a group of investors, bilk them, then shut down and open under a new name," said Craig Rasile, a Miami attorney who has represented court-appointed receivers in securities fraud cases. "Most boiler rooms, or bucket shops, as we call them, are up and running for six, eight months a year, then these guys are gone." Ivan Harris, an SEC assistant regional director, said repeat violators are "one of the most frustrating things" for regulators because civil sanctions don't necessarily stop them. That fit the profile of the men behind International Currency Consultants, a Delray Beach boiler-room operation that allegedly solicited more than $1.6 million worth of unregistered securities from investors in a foreign-currency trading program, according to the SEC. Regulators said the company's top sales agent lied to investors that others had made more than 800 percent on their investments. In October 2001, a federal judge ordered the company's owners, William S. Cordo, of Delray Beach, and Mitchell S. Davis, of Royal Palm Beach, to stop violating securities laws and fined them $15,000 each. The men agreed to the judgment without admitting or denying the allegations. Gary Feder, a Coral Springs attorney who represented Cordo and Davis, said they had no comment. He said the case was settled before it got to court, adding: "We don't know if the government's case ever would have held water." Cordo and Davis had been in trouble before over deceptive sales pitches. In 1995, the National Futures Association, a self-regulatory organization for the U.S. futures markets, cited the two men and a Delray Beach company they ran for high-pressure sales techniques and deceptive promotional material in selling commodity futures, records show. Investors lost almost $7.5 million and paid about $3.7 million in commissions. In a settlement agreement in which Cordo and Davis neither admitted nor denied the allegations, the futures association fined the men and the company $100,000. Jon Ruthven, a theology professor at Regent School of Divinity in Virginia Beach, Va., said he didn't know about the association's case when he plowed $40,000 into International Currency Consultants. But he had checked with the SEC and the Better Business Bureau to see if any complaints had been lodged against the company and had even flown to South Florida to meet with company representatives, he said. Ruthven, 61, never got returns on his investment and lost all but $7,000. "This wasn't throw-away money. This was my savings," he said. "I don't know why I was so utterly stupid. "If some black kid went into a 7-Eleven and stole a bunch of stuff out of a cash register and hightailed it down the street with $200, and he did it a couple of times, he'd be in jail," Ruthven said. "For these white-collar fraud guys, crime pays. The government doesn't seem to be interested in stopping it. It's a cynical system." The SEC and U.S. Attorney's Office in Miami were optimistic in January 2001 when they proclaimed that they had set up a task force with other federal agencies to crack down on phony investment schemes and send scammers to prison. An SEC lawyer even was detailed full time to the U.S. Attorney's Office to help develop cases. The SEC understood that its ability to go after the worst offenders was limited because it can only file civil lawsuits. Criminal cases must be referred to the U.S. Attorney's Office for prosecution. While the SEC doesn't keep statistics on how many cases it has farmed out to criminal authorities, Eric Bustillo, the assistant U.S. attorney who heads the Miami office's economic crimes unit, estimated that the number of SEC-related prosecutions has risen from 11 in 2001 to 27 in 2002. He said his office has tried to "have a greater impact and send a clearer message that if you engage in these types of conduct you are more than likely to pay the consequences." Still, he said, his staff members have their hands full with other white-collar crime cases, such as identity theft and money laundering. "Not every SEC case is a criminal case," Bustillo said. "But it's become more of a priority because of all the corporate scandals and the impact on the markets and the loss of investor confidence." The newspaper's review found that criminal prosecution is not routine. More criminal cases have been filed since the task force was set up, but they represent less than a third of the violators the SEC has sued for investor rip-offs during that period, the analysis showed. "Lack of criminal enforcement is a huge problem," said Christian Bartholomew, a Miami attorney who worked for the SEC and now is appointed by judges to recover investor funds in fraud cases. "Civil sanctions aren't a meaningful deterrent in these cases of fraud. For these people, civil sanctions are effectively a cost of doing business." The SEC's Nelson agrees that his agency's effectiveness is questionable when it comes to "fraudsters," which is why the U.S. Attorney's Office needs to prosecute these cases. "We can have tremendous impact on a Fortune 500 company, but much less of an impact when someone is running a boiler room in Pompano Beach," Nelson said. 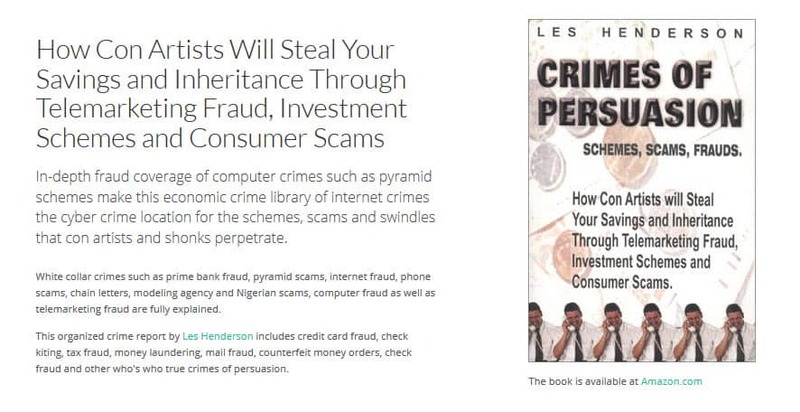 "The only thing someone with a history of these scams understands is a jail cell closing behind them." But the newspaper's analysis of the regional office's cases found that in the past five years, only 16 people were sentenced to prison as a result of a regional SEC fraud case or a simultaneous criminal investigation. Another 27 are awaiting trial or sentencing. Those don't include 28 people whom the SEC charged civilly after they already had been convicted of a crime. Regulators point out that federal sentencing guidelines are getting more strict and more white-collar criminals, particularly recidivists, are winding up behind bars. They concede, however, that some repeat violators never have been charged criminally. That's the case with Kenneth R. Grossfeld, 56, and Donald E. Rhoades, 71, "undisclosed principals" who controlled Web Hosting Headquarters Partnership, a North Miami Beach boiler-room operation that allegedly defrauded 132 investors, many of them doctors, out of at least $2.5 million, according to the SEC. The December 2000 SEC lawsuit alleged that the company, which hosted Internet Web sites, exaggerated customer numbers and misled investors about potential returns. In a 1,500-square-foot office, about 30 salespeople operated more than 50 phone lines, urging potential investors to put their money into partnerships, court records show. The walls and credenzas of their desks were blanketed with scripts and mottos such as "Excitement. Urgency. Greed." In October 2001, Miami U.S. District Judge Shelby Highsmith permanently barred Grossfeld, of Miami Beach, from violating securities laws and ordered him to pay $1.6 million. He then waived about $970,000 because Grossfeld testified he didn't have the money. Grossfeld agreed to the judgment without admitting or denying the allegations. The SEC also barred him from the securities industry. Grossfeld's attorney, David Garvin, of Miami, said his client settled because it would have been too costly to fight in court. In April, Rhoades, of Sunny Isles, agreed to a similar sanction, also without admitting or denying the allegations. He was ordered to pay about $1.05 million in fines and penalties and also was barred from the securities industry. Rhoades' attorney, Alvin Entin of Fort Lauderdale, said his client did not commit fraud and was running a legitimate business that the SEC prematurely shut down. "They go in on technical violations and cause more harm than good," Entin said, noting that his client chose to settle because if he were found guilty, he would have faced penalties anyway and it would have sullied his name. Grossfeld and Rhoades are repeat violators with disciplinary histories, records show. In 1986, the Commodity Futures Trading Commission fined Grossfeld $52,500 for misleading customers and engaging in unauthorized trading while managing a brokerage company office in Miami Beach. In 1988, the National Futures Association fined him $10,000 for running a commodities firm that cheated or deceived customers. And in 1995, the futures commission fined him $1.8 million and revoked his registration for misrepresenting facts when soliciting customers. Attorney Garvin said the last two actions resulted from the same allegations and his client felt it was wrong to be accused of the same thing by two agencies. "He was very upset by this," Garvin said. "He felt he was treated unfairly." Rhoades, too, has a lengthy history of violations. In 1982, Iowa regulators ordered him to stop selling unregistered interests in an oil and gas lease lottery. In 1984, Florida securities regulators charged him with civil fraud for being a principal in a North Miami Beach company that used high-pressure sales tactics to solicit investments in precious metals, according to state records. He settled the case by agreeing not to defraud investors. In 1985, the CFTC accused Rhoades of fraud, revoked his registration and fined him $10,000 when he was chairman of a North Miami Beach commodity trading advisory company. Ten years later, Virginia regulators ordered Rhoades to stop selling unregistered securities in a "purported interactive television company" and fined him $2,000, records show. Rhoades' attorney, Entin, wrote to the newspaper that his client made a "business decision" not to contest the actions in Iowa and Virginia, but never admitted guilt. "Mr. Rhoades decided that it was more fiscally responsible to bypass in each case one state and continue to do business in 49 others," Entin wrote. Securities regulators concede that investors are lucky to get a dime or, at most, a quarter back on every dollar they've lost in investment scams. The money often goes into huge commissions many boiler-room operators pay sales people to keep the investors coming. Company officials often take big chunks of money for their own freewheeling lifestyles. Some stash cash in accounts outside the country, making it difficult to track or be returned to investors. "When we find them, we try to stop them as quickly as possible, and grab the money, but they often send it offshore or hide it in other ways," said Joan McKown, chief counsel for the SEC's division of enforcement in Washington. In many fraud cases, the SEC asks the court to impose financial penalties and "disgorgement," an order for the offender to pay back money he's defrauded so he doesn't profit from "ill-gotten gains." When feasible, the SEC tries to return that money to investors. But the newspaper investigation found that only about $6.5 million of the $176 million in penalties and disgorgement ordered in the regional SEC office's cases in the past five years actually has been paid. At least $36 million was waived because offenders indicated they didn't have the money. Other judgments were so recent that offenders may not have had time to pay. The analysis showed that more than $124 million in sanctions resulting from cases filed between 1998 and 2001 has never been collected. The U.S. General Accounting Office, the investigative arm of Congress, issued a report last July criticizing the SEC's collection program and its success in returning money to investors. The GAO found that the agency's collection rate was only 14 percent for $3.1 billion in disgorgement ordered nationwide from 1995 through 2001. But auditors noted that the rate wasn't an accurate measure because it fluctuated, depending on whether a few violators made large payments in a single year. "The rate varies wildly from year to year. It depends on who we sue," said the SEC's McKown. "If you sue a reputable broker-dealer who has assets and values their reputation, you're going to collect the money. If it's a large Ponzi scheme, they could care less about their reputation, so the collection rate is not going to be very high." SEC officials emphasized that they're not a collection agency and don't have the staff or budget to recoup fines from all offenders. They said they do try to collect, but when they can't, they turn the matter over to the U.S. Treasury Department. McKown said new funding from Congress has allowed the agency to begin hiring more in-house collection attorneys, who plan to pursue legal remedies that include liens and wage garnishment. Each regional office has begun monitoring collection efforts and the SEC is asking Congress for authority to hire private-collection attorneys. In the past year, the agency has been requiring all violators to put the penalties they owe into an escrow account before signing a settlement agreement, to ensure they will pay, said the SEC's Harris. In securities fraud cases where money is still available, the SEC often will ask the court to appoint a receiver who will take control of the company's bank accounts and other assets, change the locks on the doors, send out claim forms to investors and gather and distribute remaining funds, with a judge's approval. Receivers often auction items, such as cars or boats, and sometimes sue banks and other third parties that may have been indirectly involved in the fraud, in hopes of getting more money for investors. Receivers themselves can deplete the assets, out of which come fees for them and any attorneys and forensic accountants they hire. SEC officials don't keep statistics on the total amount receivers have been able to return to investors. They said that while some have been quite successful, often, there's not a whole lot of money left. "On a number of cases, nobody gets anything back," said the SEC's McKown. The SEC thinks that happened with World Class Limousines Inc., a Pompano Beach exotic limousine rental company that regulators said fraudulently raised at least $1.9 million in stock and promissory notes from 89 investors worldwide. A December 2001 SEC lawsuit said the company solicited over the Internet and by "cold calling." The SEC alleged that company President Anthony P. Caliendo, 34, diverted at least $615,000 of investors' money and used it for risky stock trading, and spent $11,000 for a cruise vacation, $2,000 at a plastic surgery center and $2,000 for a pool table. Caliendo's attorney, Kenneth Dunn, rebutted the fraud charges, and said his client had invested more than $100,000 to help start the company. He didn't take a salary, Dunn said, so when he took trips or incurred other expenses, he had the company pay bills directly. "He was a guy that didn't cross his T's or dot his I's," Dunn said, adding that the SEC froze the company's assets on a technicality before there were any findings of wrongdoing, which left Caliendo without enough money to fight the case. David R. Chase, the court-appointed receiver, auctioned off two limos and a limo party bus, but said he wasn't able to get anything for investors by the time expenses were paid. "The day we went in there, there was nothing left," he said. Alma Carney, the nurse's aide who lost her life's savings to A.B. Financing, worries that she, too, could end up one of those frustrated -- and broke -- investors. She's disappointed in the job federal regulators have done protecting her. "I think in America they should be more careful about letting people go on doing these kinds of things to poor people," she said. "I didn't know this could happen in this country. It's ridiculous." Staff Writer Antonio Fins contributed to this report.